Large, glossy, deep purple skinned oval fruit about 13cm long. Fruit holds quality and colour well after picking. Best to raise this heat loving vegetable from seeds in the greenhouse, especially in Britain, to make sure you raise strong, healthy seedlings. 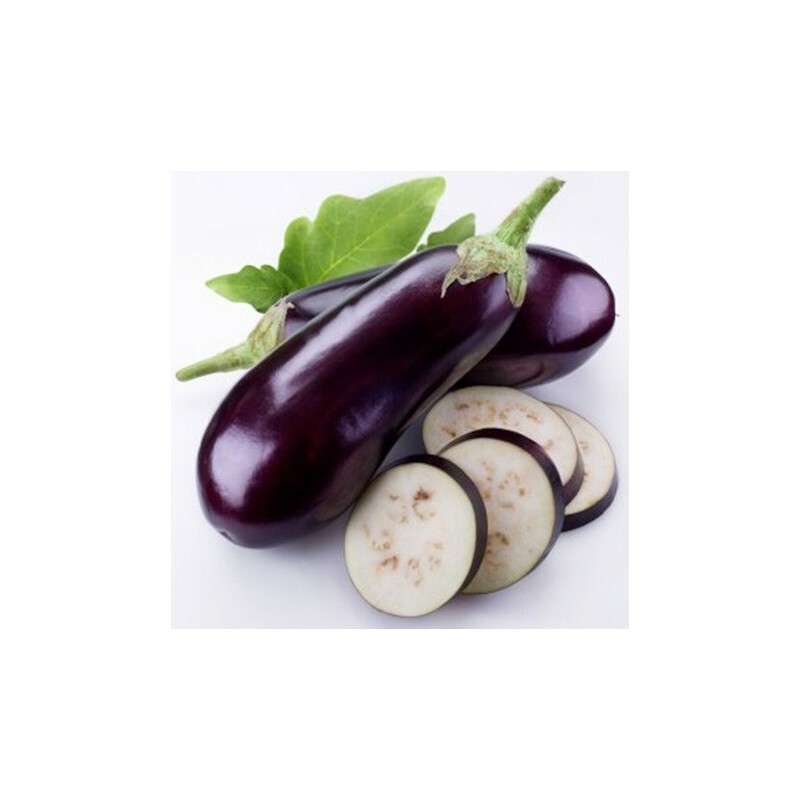 Aubergines are high in potassium, folates and magnesium and a good source of Vitamins E and K. For best results you should grow aubergines in a greenhouse, polytunnel or conservatory. Can be grown in large pots, in a sheltered spot on your patio. A very popular variety which made it into our veg seed collection too. 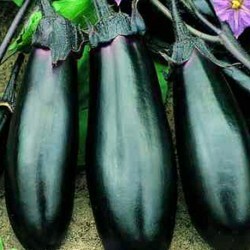 Aubergines are a warm growing plant that takes a relatively long time to fruit (usually about 68-100 days). This means they must be started ahead of time to produce fruit in most climates, usually 6-8 weeks. Aubergine seedlings are quite robust and transplanting encourages strong root growth. Start together to separate out after sprouting. Soak seeds to soften the seed coat. They should be placed on pre moistened soil, spaced out to make room to sprout. Cover with approximately 1/8” of potting mix and water in. 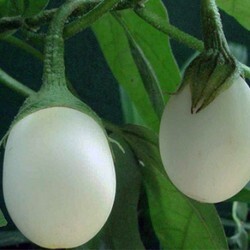 Since aubergines are a semi tropical plant, bottom heat will speed up germination and also increase germination success. Let the soil slightly dry before you water the seedlings next, to avoid rot. Fertilize weekly after 3 pairs of true leaves appeared with a low strength fertilizer like 5-5-5. If you growing your aubergines under a propagator, make sure you condition the seedlings to room temperature before removing the cover completely. Select a 3 or 4 inch pot and lightly pack it full of pre-moistened soil, this will settle when you water it. Separate out your seedlings, and remove any malformed or stunted ones. Be careful not to break the stems. With aubergines, like many other plants in the nightshade family, the stems root easily. Bury them up to their lowest leaves in order to promote new roots. If you are worried about them surviving transplanting, you can put multiple in a pot and thin them a week or so later. Your aubergines should be happy in their 3-4” pot until it is time to plant them out. Let them dry between watering and provide lots of light and air movement to prevent molds. As your plants grow, increase the strength of the fertilizer to meet their growing needs. Aubergines often have fuzzy leaves that can trap moisture so be careful not to get too much water on the leaves. Once the weather and soil have warmed it is time to plant out your aubergines. Aubergines require warm soil and grow best if night time temperatures are warm too. First, be sure your daytime temperatures are above 15 C and your nighttime temperatures are above 10C. A sunny location is the best for aubergines, but a greenhouse might be necessary to grow them successfully. Also avoid wind at first for aubergines as the large leaves can be prone to tearing. Then, gradually increase the time in the sun and wind. This whole process can be done in 4-5 days usually. First, dig the soil well to loosen and aerate it, a well prepped site makes all the difference for the transplants. Dig your hole and add compost and other amendments like in the preparation of the transplant soil. If it is dry, water the hole before planting. If you live in a wet place, consider adding sand for drainage or planting your aubergines in small mounds. Mounds also allow the soil to get warmer which means you will get even more fruit. A good layer of mulch will help keep weeds down and moisture where your plant can use it.